While it would be incredibly easy to begin by lambasting national publications like Harpers, The Paris Review, The New Republic, New York Review Of Books, Times Literary Supplement, The New Republic and The Nation for their gross (& indecent) neglect of female writers’ work, I fear the attention we’ve already given them has either motivated their editors to disdain the mirrors we’ve held up to further neglect or encouraged them to actively turn those mirrors into funhouse parodies at costs to women writers as yet untallied. Reason hasn’t worked. 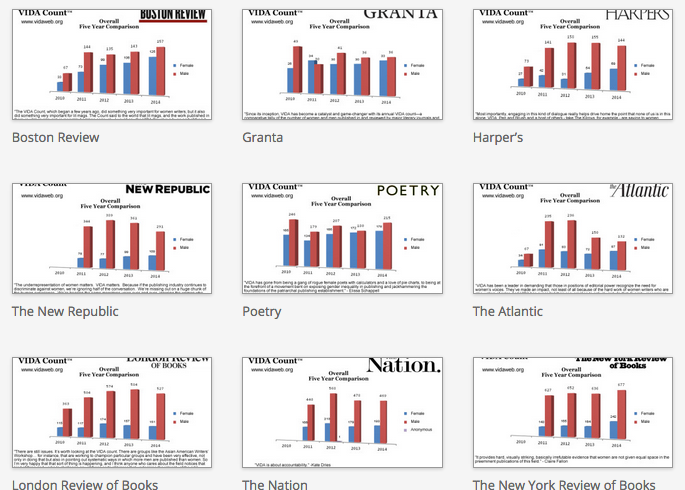 The devolution among their ranks screams itself increasingly red in the VIDA comparative charts. At this point, the publications with the “most men” simply do not win. My guess would be that the problem is less malign, but more insidious. I’d be willing to bet that every editor of every publication on this list is, in theory at least, committed to the principals of gender equity. But I’d also be comfortable laying money on the idea that they’re equally convinced that their subconscious biases, reliance on familiar authors, and processes to sort submissions and identify new contributors are sound and don’t in any way work to produce byline inequality. They’re probably uncomfortable with the idea of quotas and target numbers, in part because they want to have faith in their own processes. In other words, they can acknowledge a problem without thinking that it’s their problem. And making that connection is what’s important. Literary stalwarts like Tin House and The Boston Review are doing more and better. In the case of Tin House, the editorial staff has publicly declared that they’re making a conscious effort to publish more women authors. (To Alyssa’s point, the editor, Rob Spillman, has made the connection that the underrepresentation of women voices in his magazine is his problem to correct.) Yet, I wonder too, if we’re not making ourselves visible or known. As one of the editors of a literary startup, men outnumber women submitters by 3 to 1. (I should also note that women are submitting work in greater numbers to our literary magazine in the past year). I don’t believe it’s self sabotage, but I bet we could lean in, you know (no shade, I actually plan to *read* her book first). However, I wonder if perhaps it’s more than just relying on gender imbalanced editorial staff, accustomed to using writers they know or feel comfortable with, to do the good work of capturing new talent. Or if women contributors are steered, isolated toward writing “women-themed” content. Three years of counting an imbalance we’ve quietly observed for years isn’t enough time to manifest systematic change within the publishing world. But it’s a critical tool in informing the conversation about representation in our culture–the voices we celebrate, the witnesses to our histories, and the legacies we’ll leave behind. My mom came of age as a feminist in the late 70s, and man, did it show. 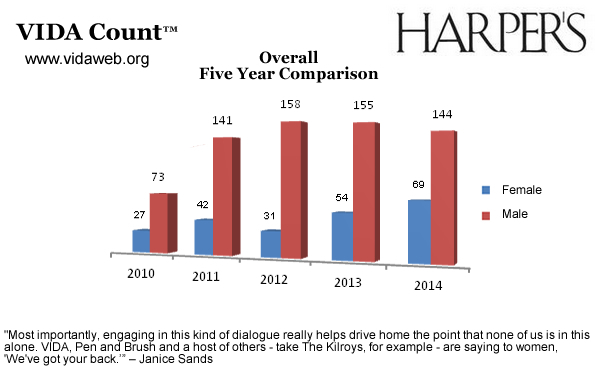 Overall, there’s been little progress since last year when I highlighted several charts from the report illustrating how dominated by white men the media landscape is. Yet again the report provides a wealth of depressing factoids. 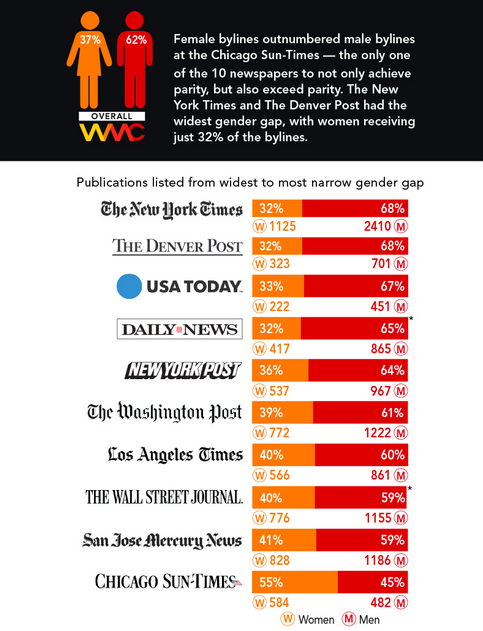 Such as: Last year, only 37 percent of the news was generated by a woman. Just 12 percent of movie protagonists are women. There are 7 percent fewer women in sports journalism than last year.